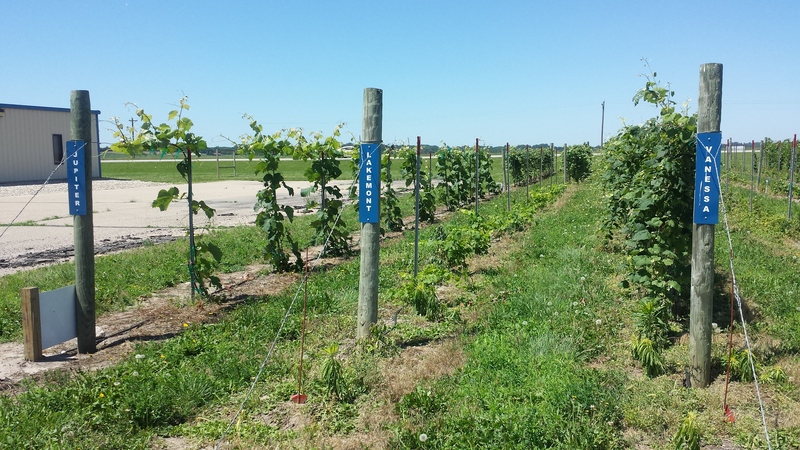 As many of you know, HCC substantially expanded the College vineyard acreage in spring 2014. As our staff has found, keeping track of the expanded vineyard (5000 total vines!) has left little time to post in this space. Rest assured, Viticulturist Dylan Rolfes has been diligently keeping track of data in the Research Vineyard through the spring and summer. However, a giant chunk of data is difficult to compile and make readable while tending to all of the new vines. The data will be posted when it’s ready. First of all, we had some varieties that did not over-winter well. Some recovered and some didn’t. 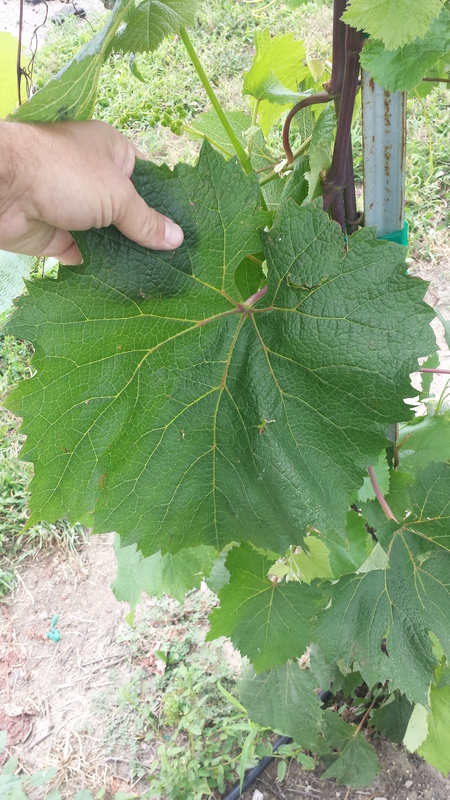 Most notably, the Jupiter (seedless) grapevines had grown and had beginning cordons trained on the wire in late growing season 2014, but in spring 2015 they started pushing new shoots from the roots. Their cordons and trunks were completely dead. We were very surprised at this finding. The even more surprising finding is that the new growth from the roots has been SUPER-vigorous. The new growth is all the way back up to the wire and new shoots trained to be cordons. In fact, these vines have some of the biggest leaves I’ve ever seen. I’ll post a recent photo of the Jupiter vines below. There were a few varieties that did not fair well through the 2013 winter and eventually were chosen to be replanted with new varieties because all 12 vines were dead. In Fall 2014 they were cut out and the soil prepared for new plantings. The varieties that were taken out of the vineyard were Neptune (seedless), Cabernet Franc (Vitis vinifera), Chardonnay (Vitis vinifera) and Gruner Veltliner. These four varieties were replaced with Lakemont (seedless), two new varieties recently released from Cornell Arandell and Aromella, as well as Muscat Ottonel (Vitis vinifera). So far these four are doing very well. 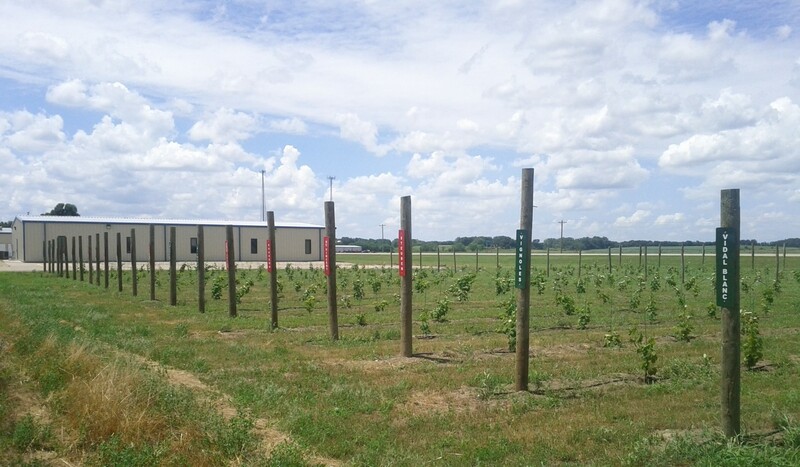 The other Vitis Vinifera were kept because at least half of their rows had survived through Fall 2014. Replants were ordered and planted in Spring 2015 to replace those vines that hadn’t survived previous years. Unfortunately, some of those vines that were alive in Fall 2014 did not come back in Spring 2015. Therefore, we still have “half-rows” of Vitis vinifera in the Research Vineyard. It could be that mother nature is trying to tell us something about vinifera at this particular site. As for casual observations (as opposed to pruning weights, cluster numbers, etc.) I can say the Research Vineyard is growing marvelously, for the most part. The varieties that were part of the original planting look like 4- or 5-year old vines even though they are only in their 3rd year. Many have trunks larger around than the old C-size batteries used in flashlights years ago. These older varieties are all fruiting this year and will be harvested in Fall 2015. The fruit will likely be made into a large blend of wine this year, but plans are in the works for potentially create a winemaking research project to parallel the grape growing research. Such a project will take LOTS of time, making up to 44 small batches of wine and keeping them all separate. The project is in the works, but by no means a done deal just yet. Other observations are that this vineyard was hit by chemical drift again this year, twice. The initial hit was around mid-June when all of the area farm fields finally dried out enough for the soybean farmers to spray and plant beans. There was about a three-day window when this happened, but it’s impossible to know which field caused the drift. More recently a much more damaging hit of drift found the vineyard. Likely around a week to 10 days ago. This second dose of chemical drift has wildly damaged the vines, many vines having shoots with severe damage to 6-8 young leaves. As expected, some varieties are less sensitive than others to the drift damage, but there are no varieties that show zero damage. I’ll provide details about which are suffering the most in my next post, likely next week. Here are some recent photos.